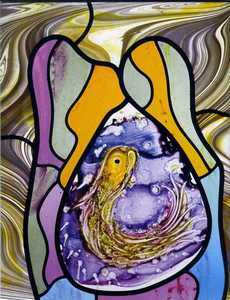 Except for his paintings, the Dutch artist Marc Mulders is also known for his stained-glass windows. 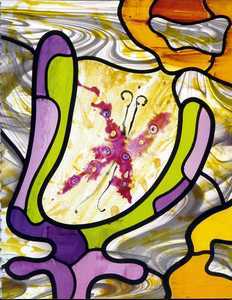 Some he has made for secular settings, as for instance the stained-glass window A Garden of Glass (2005) in the Nieuwe Kerk in Amsterdam, which was a commission for the silver jubilee of Queen Beatrix. But his windows can also be found in churches where worship services take place. 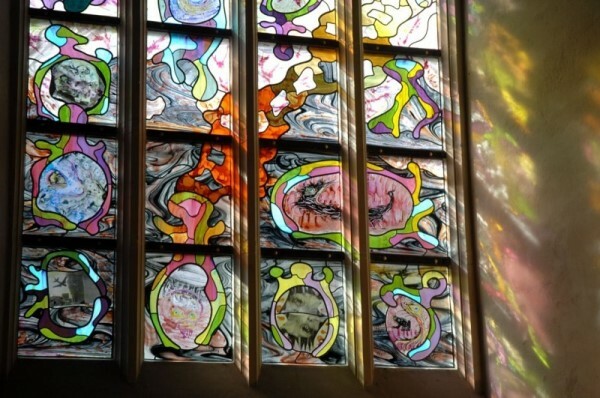 His Apocalypse window (2006) is one of the highlights of the Catharijneconvent, Museum for Religious Art in Utrecht. It is thematically related to the Last Judgement window (2006/7) in the St. Jans Cathedral in Den Bosch. When you walk into the St. Jan Cathedral the window is located near the main entrance at the west side – the west where the sun sets. Due to its many panels with its predominantly non-realistic figurations the window can be overwhelming at first, but after a while one starts to see depictions of good and evil. The window has a classical composition: heaven at the top, the purgatory in the middle and hell at the bottom. The colours are pastel and soft. 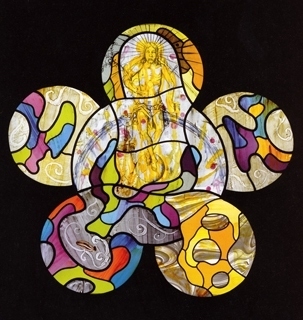 At the top we see Christ in subdued yellow, with grey, violet and some green-blue tones. In the middle the reddish pink stands out and in the bottom section we find darker colours, dark grey but also blue, green and yellow. For some the title The Last Judgement conjures up the frightening images of judgement and hell by Jheronimus Bosch (whose name is derived from Den Bosch, as he lived there). Also in contemporary churches the apocalypse can be portrayed rather aggressively. With Mulders it is different, as there are pastel tones even in hell. The seriousness of evil, however, you cannot overlook. To Mulders the essence of contemporary evil is terrorism. 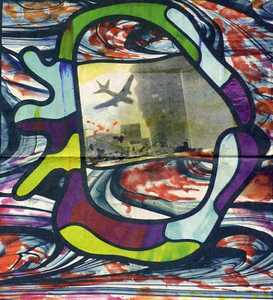 Using silk-screen printing he inserted a photo of the attack on the Twin Towers of the World Trade Center in 2001 (9/11) into the glass, just like he portrayed attacks in London and Madrid in the Apocalypse window in Utrecht. Evil is rendered in all its shocking brutality: we see a plane fly towards one of the Twin Towers. How do we see in the window what Mulders said about the victory over evil? 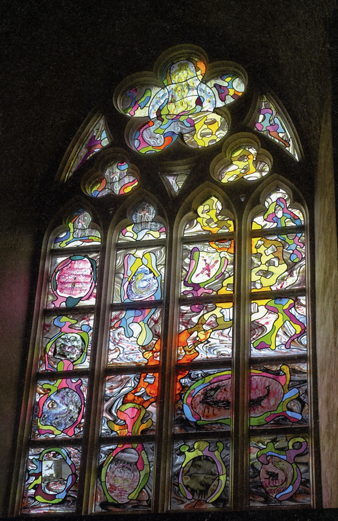 Christ is depicted in the very top section of the window as judge, sitting on a rainbow as a sign of the covenant between God and humanity, with the sword of justice and the lily of mercy in his hands. Christ is seated up high, while all around us – in the middle section of the window – evil rages. In two ways Mulders has ingeniously connected heaven, earth and hell: by way of an iris and a ladder. The iris is spread out all over the window: from the upside-down iris in hell below to the half-opened iris in purgatory, to the wide-open petals at the foot of Christ’s throne. Traditionally the iris stands for purity and for this reason it is often connected with Mary. More generally the iris is a sign of reconciliation between God and humans. Its petals have the form of a sword and that’s why the flower also refers to the words of Simeon addressed to Mary: “And a sword will pierce your soul” (Luke 2:35), by which the evangelist refers to the suffering of Mary during the passion. In the top section underneath the throne of Christ the iris has its petals opened up in such a way that Christ is worshiped. Just below this the iris embraces symbols of victory over evil and resurrection: the peacock, the fish and the butterfly. As the petals of an iris can also be swords, Mulders can use them in hell as well. Tilted, the petals form a greedy mouth at the end of a grabby arm. In the lowest row of panels we see how the devil has taken possession of the beautiful iris. 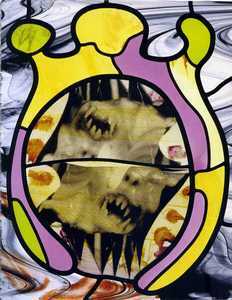 He gives birth to a skull and encloses 9/11, the beast of the Apocalypse and a black frog. Thanks to the iris heaven and earth are connected. But can we also follow a path that conquers evil? A ladder moves from hell to heaven, ending at the rainbow on which Jesus is seated. Mulders uses the classical theme of the “ladder of heaven” here. It goes back to the dream of Jacob (Genesis 28:12-13), but was later elaborated by John Climacus and others as the heavenly ladder, the way of victory over evil as the way upwards. With the help of angels good people may climb up towards the loving Christ, a path which the person who chooses evil cannot go. Mulders’ ladder has been referred to as a kind of flapping ladder that moves like a spine along purgatory to a heaven full of light. What sets Mulders’ religious work apart is that he incorporates classical Christian themes in a contemporary manner in his works. In 1989 he said that he desires to portray the Holocaust, the nuclear century and our own time in his work. 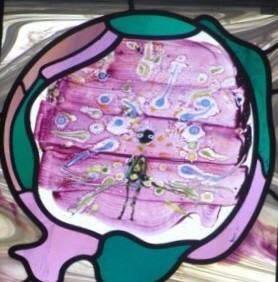 That is what he does in this window about the last judgement. 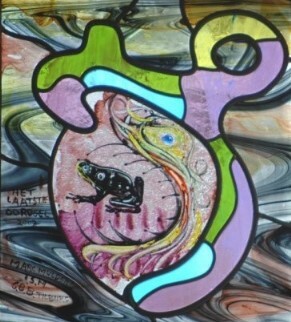 He makes use of the old Christian iconography, presenting it in his own not directly realistic style. The window can comfort the viewer as Christ sits on his throne as a merciful God. He sits there half-naked as if he just walked away from the earth, away from the drama of the cross and the resurrection. Marc Mulders: The Last Judgement, 2006/7, St. Jans Cathedral in Den Bosch, The Netherlands. Wessel Stoker was the occupant of the endowed chair of Aesthetics, associated with the Faculties of Philosophy, Theology and Arts, and Associate Professor of Philosophy of Religion in the Faculty of Theology, Vrije Universiteit Amsterdam until his retirement in 2011. At the present time he is guest professor at the Vrije Universiteit Amsterdam.